I created this card for last week’s Inspiration challenge. For my sample I chose this darling stuffed giraffe. 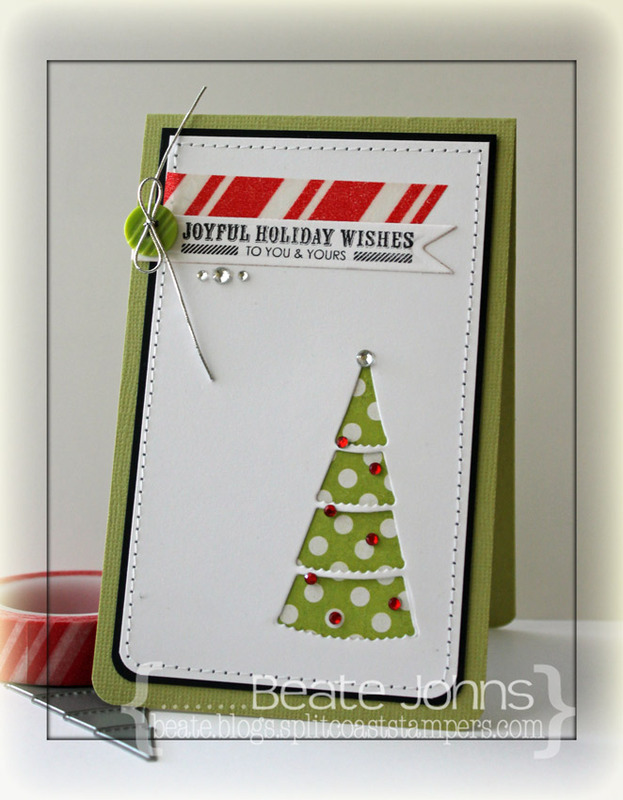 The color scheme for this card came from last week’s Ribbon Reel Challenge. The sketch is from the current CASE study challenge. I started by cutting a piece of Neenah Solar White cardstock with the giraffe die from MFT’s Spectacular Circus stamp and die set. 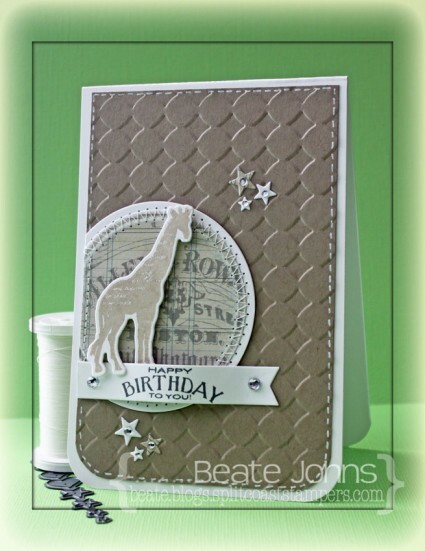 The matching giraffe stamp was stamped over it in Wheat VersaMagic ink. A piece of Pink Paislee Portfolio patterned paper was cut and embossed with a Standard Circle Nestabilities die. The edges were sanded before the circle was stitched to a slightly bigger white cardstock circle. A 3 1/2″ x 5 1/4″ piece of Kraft cardstock was embossed with the Simplicity M-Bossabilities folder. The bottom corners were rounded and a the edges were faux stitched with a Signo white gel pen. The layer was adhered to the card base, a 3 3/4″ x 11″ piece of white cardstock folded in half before the partial circle was adhered to the left hand side. The giraffe was adhered to the circle with foam adhesive squares. One of the sentiment from Circus Spectacular was stamped in Gray Flannel Memento ink on a piece of white cardstock, cut with one of MFT’s Sentiment Strips die-namics die. One of the sides was cut straight and the sentiment was adhered underneath the circle with Scor-Tape on the edges and two foam adhesive squares on top of each other in the center. Stars were cut out Solar White cardstock as well as the same paper that was used for the circle with SimonSaysStamp exclusive Holiday Shapes die. The stars were adhered to the card and topped with rhinestones. A rhinestone on each end of the sentiment strip finishes off the card. 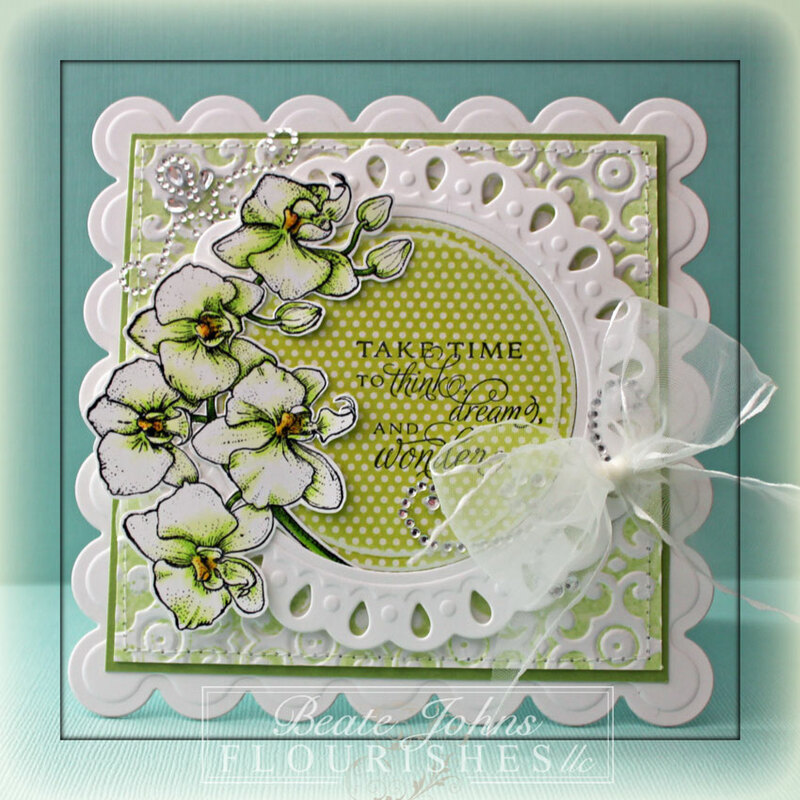 Here is another super quick CAS card I created for an inspiration challenge on Splitcoaststampers. For this card I used the Empirical Style Pennants as inspiration piece. The card base was cut and embossed with the largest Rounded Banner Stax out of Neenah Solar White cardstock. 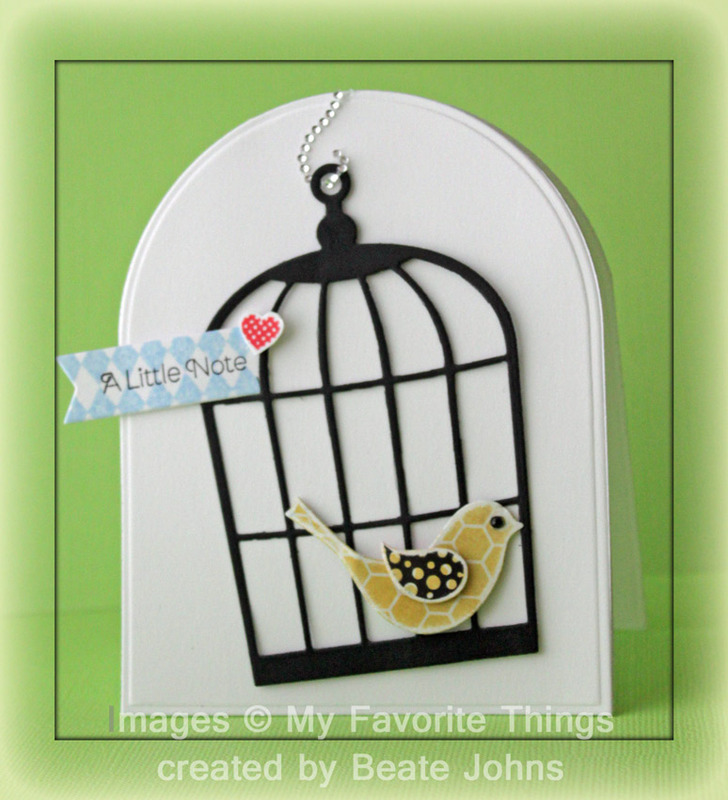 A cage was cut out of black cardstock with a die from the Contemporary Cage stamp and die set. it was adhered with foam adhesive squares a bit off kilter. Part of a Fancy That! BorderBling was used as hanger to center the bird cage to the card. Bird pieces were cut out of My Mind’s Eye Honey patterned paper. The edges of the paper were sanded and the wing was stamped with a matching image from the set. A black rhinestone was used as an eye and the bird was adhered to the cage with square adhesive foam. A piece of white cardstock was cut with an MFT Sentiment Strip Die-namic die. A sentiment from Contemporary cage was stamped in to the right and the left end was cut off. Small diamonds from the Distressed Diamonds stamp set was stamped in Summer Sky Memento Ink over the sentiment panel before it was adhered to the upper left hand side of the cage. A little heart stamped in Ladybug Memento Ink was cut out and adhered to the top right of the sentiment panel to finish off the card. I created this card for a recent Inspiration Challenge on Splitcoast. Stef picked a great site to draw inspiration from. As soon as I saw this cake, I knew I wanted to use Flourishes gorgeous Orchid stamp set. I stamped the Orchid image in Tuxedo Black Memento Ink on Neenah Solar White cardstock and colored it with Copic Markers (YG0000, YG01, YG03, YG17, Y13, Y17 and red spica pen). The image was cut out and adhered to a frame cut and embossed with the largest Tear Drop Circle and a Standard Circle Nestabilities die. 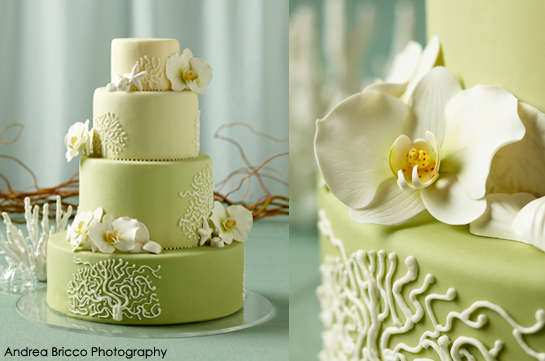 With the same Standard Circle die used for the frame, a piece of MME Lime Twist Life is a Party was cut and embossed. The edges were sanded and the circle was layed inside the frame. The orchid was adhered over the frame and paper with dimensionals. A sentiment from the orchid set was stamped on the right hand side of the paper with Tuxedo Black Ink. 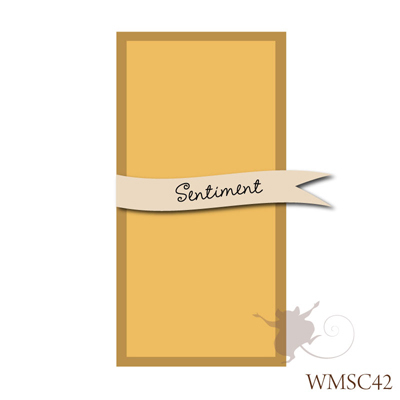 A 4 3/16″ square of Solar White cardstock was embossed with the Elegance M-Bossibilities folder (I do love that folder!) that had been inked with New Sprout Memento Ink. It was stitched to a 4 1/4″ square of Sour Apple Cardstock. A piece of my new favorite May Arts ribbon was threaded through one of the Tear Drop circle holes and tied around the layers. The frame was adhered over the squares with dimensionals. The card base was cut and embossed with the second smallest Grand Scallop Square Nestabilities dies. Nina Brackets gorgeous new Fancy That! Border Bling and parts of a Finesse Rhinestone Swirl finish off the card. It’s Saturday which means it’s time for another Waltzingmouse Sketch challenge as well as the Inspiration challenge on Splitcoast. This week I got to combine both because Stef picked a site I suggested as the inspiration site. When I went through my Pinterest craze, I found the English site Cox & Cox. For my sample I picked this gorgeous wooden hanging heart as my inspiration piece. The card sketch is a simple one which worked great for what I had in mind. To invoke the painted wooden feel of the heart I brushed on Snowcap Adironback Paint dabber all over a 3 1/4″ x 5 1/4″ piece of Kraft cardstock. 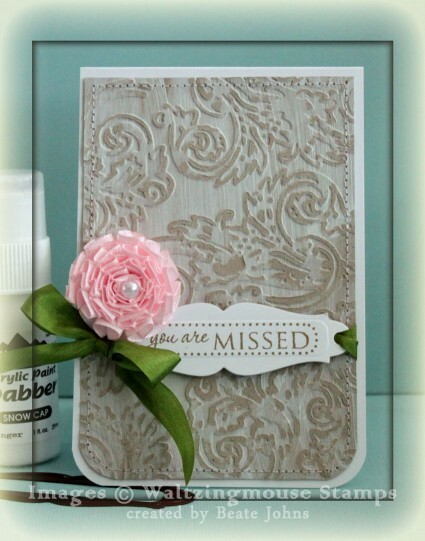 Once it dried I embossed it with Tim’s Damask Embossing Folder. The raised part of the embossing was sanded to let the Kraft cardstock show through. The bottom corners of the layer were rounded before the edges were stitched. A piece of Solar White cardstock was cut and embossed with one of Spellbinders new Grommet Tag dies. A frame and sentiment from Waltzingmouse’s Fancy Phrases was stamped in it’s center with Frayed Burlap. The sentiment tag was attached to the embossed layer with silk ribbon. The bow was topped with an EK success ribbon flower, I picked up at Target. The layer was adhered to a 3 1/2″ x 11″ piece of Solar White cardstock folded in half. The bottom corners were rounded again to finish off the card.